Renew intentions at the beginning the astrological year with this dreamy lunation! 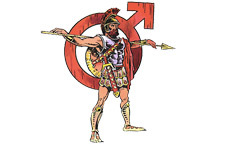 Hot-headed fire sign Aries is ruled by mighty Mars, planet of war, aggression and fighting. What else does this assertive planet represent and what does it mean for our Star Sign Style? Find out more, including the place this planet holds in our birth charts. Remember, you are not just your sun-zodiac sign, it’s so much more complex!